This is a women’s chorus for advanced singers where symphonic choir literature, oratorios and a cappella pieces are sung. In all periods of music history challenging choral literature has been composed for women’s voices and this group dedicates itself to this repertoire. This choir mainly sings works for women’s voices but projects with the mixed choirs are also undertaken. Singers in this choir have a certain sight reading skills and basic knowledge of vocal techniques. The age of the singers ranges from 20 to 50 years; both students and alumnae are welcome. An audition with a voice check is required. In the summer term opera choruses will be sung in the concert series ​“The World of Opera” and in June the Polovetsian Dances by Borodin will be performed in the series ​“Masterpieces of Russian Music”. 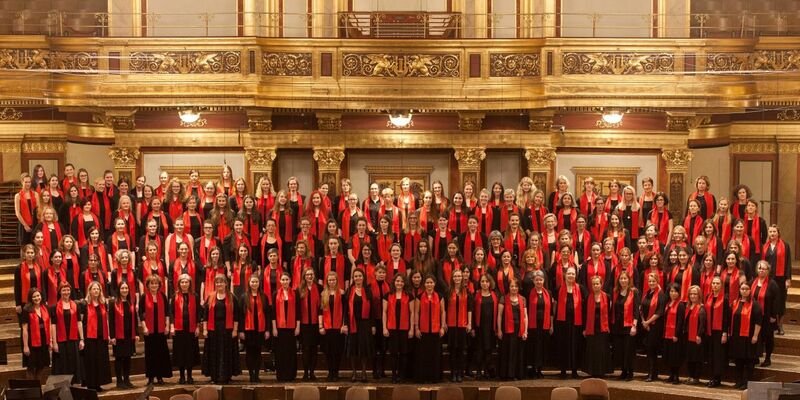 In December 2018 the choir participated in the gospel and pop Christmas concert at the Vienna Musikverein. In the summer term 2018 songs by Rachmaninov as well as the wonderful ​“Stabat Mater” by Pergolesi were performed. In December 2017 the European premiere of Vijay Upadhyaya’s 2nd Symphony was sung. In the previous academic year, a world-music concert as well as Beethoven’s 9th Symphony and Orff’s Carmina Burana were presented. We are accepting all voices in the spring term 2019. A voice check is necessary but no sight reading test is required. It is expected though that singers have certain reading skills. Rehearsals: Wednesday 6 – 7.45 p.m. "Stöckl Building"